Winter is coming! Aside from being a phrase on the Stark’s family seal on HBO’s hit show Game of Thrones, the phrase is also has a strong connotation in the show to mean “trouble is coming.” On the cable TV show, the “trouble” comes in the form of white walkers, essentially frozen zombies. In real life, the trouble comes from the harsh season that uses decreased temperatures and increased environmental concerns keep us kayak anglers cozied up on the couch instead of on the water! Don’t get us wrong, there are some serious perks of toughing out the winter and going after some trophy fish. However, winter kayak fishing is not for everyone. If you are exclusively a warm weather kayak angler, we don’t blame you! We just want to make sure you are properly protecting and storing your kayak and accessories during the offseason. 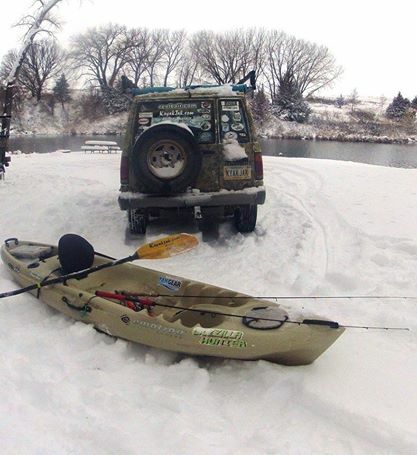 Below are some tips on how to protect your kayak this winter! Cleaning the inside of your sit-on-top or sit-inside kayak varies in difficulty, however, the cleaning process operates under the same fundamental premise: rinse everything and clean what you can reach. First, open up all the hatches and drain plugs and run freshwater through the kayak. This will create a one way highway of water flowing through the inside of your kayak, sweeping all of the excess standing water, sand, dirt, and fish guts out on the driveway. I am always surprised just how much debris gets inside my kayak after a good summer of kayak fishing. Note – The more pressure added to the water spray will bring better results. Once you have rinsed the interior of your kayak with some freshwater, it is time to apply some KC Magic or similar type of kayak protectant spray. Apply it as far as you can reach inside of the kayak. 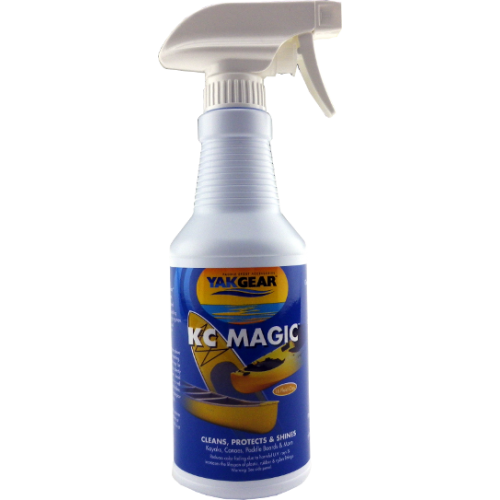 The non-staining formula of KC Magic offers UV protection (for exterior kayak care below) and helps reduce the oxidizing of your boat or accessories. The odorless spray also prevents the quickness of onset corrosion caused by contact with salt water. If simplicity is your thing, we can respect that! A light blend of soap or bleach (only on the inside) and water will suffice for acceptable levels of results. Similar to cleaning the inside of your kayak, cleaning the outside of your kayak starts with a powerful freshwater rinse and clean using the same materials. In order to reach the bottom of the kayak, I like to sit my kayak on two kayak stands. While kayak stands are convenient, excess yard furniture works fine too! If you paddle anywhere near as much as we do, you will notice lots of wear and tear on the bottom of your kayak. Spend extra time getting all the “oyster gunk” out of the “oyster rash.” Just because the bottom of the kayak isn’t in the pretty pictures, doesn’t mean it deserves any less attention. Whatever you do, try to stay away from bleach on the outside of the kayak. Bleach can really mess up seats, bungee, and other cloth accessories like leashes or straps. At Yak Gear, we know kayak accessories. We love kayak accessories. We are the guys who coat their bungee in SPF 30+ sunscreen to maximize it’s lifespan. We are the guys who use KC Magic on all of our externally mounted bases and accessories. We are the guys who treat our stainless steel pulleys to a weekend at the spa after a harsh saltwater beating. When caring for your accessories, be sure to clean them thoroughly. Keep in mind that any hardware has the potential to rust. Also, we recommend using silicone based lubricants on the any bases with a locking mechanisms. Petroleum based lubricants can cause failure of these locking bases. Before applying any offseason lubricant to your locking accessories, please check contents of lubricant or call/email us for suggestions! It may be cold outside, but the sun can still do some damage! Try keeping the kayak under cover and away from the sun and other elements. Also, be conscious of the positioning of your kayak during winter storage. Stowing it vertically on the stern is the point of least resistance. However, most people don’t have 16+ foot ceilings that they want to house their kayak under. Storing the kayak on it’s side works well too. 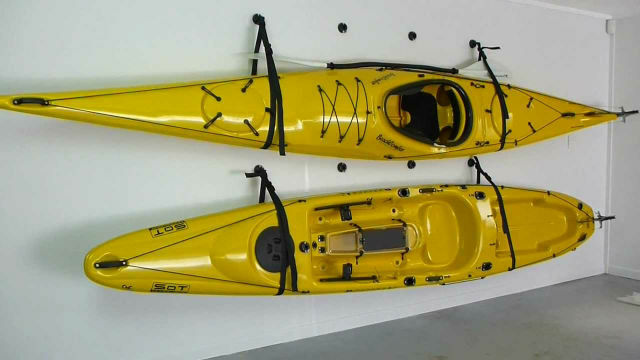 To keep your kayak stored on it’s side off of the ground, we recommend the Railblaza Wall Sling. The Railblaza Wall Sling will free up space in your garage, shed or living room (for you extreme guys) by allowing you to hang your boat on the wall. You can hang it on one pair of StarPorts to wash down, and then easily transfer it to another pair of StarPorts inside to keep it warm and dry! During the winter, periodically check to make sure the method of storage you are using isn’t putting unnecessary stress on your kayak and forming indentions. Locking your kayaks is always a good idea. You don’t have to look far on kayak fishing forums to find stories of kayak theft from a private backyard or roof rack. Locking your kayak up for the winter will help you sleep worry free. Just because your kayak is out of sight, doesn’t mean kayak fishing needs to be out of mind! This is the perfect time to gear up on replacement parts and accessories for next year. With holiday sales if full force and new products replacing last year’s editions, you can find most paddlesport gear heavily discounted from local retailers. Stay posted to social media accounts, sign up for newsletters, and pay the local retail stores a visit to see what kind of cool winter deals you can find!